The United States is linked to the countries of the Western Hemisphere by physical proximity, shared values, and vast cultural, commercial and demographic ties. 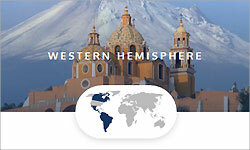 Through decades of collaboration and partnership, Western Hemisphere nations have built strong networks that facilitate the efficient movement of knowledge, ideas and technology throughout the region. Complete information on past Fulbright recipients in Western Hemisphere can be found in the Scholar Directory.